Belmopan, Belize, 29 November 2011. - The Mexican Embassy presents “Piano Gala” by Mexican musicians Marieli Sosa and Luis Arturo Romero. This presentation is part of the cultural exchange between Mexico and Belize and as a promotion of classic music in our era. Two piano concerts will be presented on the 3rd and 4th of December. The first concert will be held at the Bliss Centre in Belize City, on Saturday at 6:30 pm; and the second concert will take place at the George Price Centre in Belmopan, on Sunday at 6:00 p.m. Entrance will be FREE for both events and open to the general public. Marieli Sosa and Luis Arturo Romero will perform pieces by Bach, Beethoven, Schubert, Liszt, Brahms, Prokofieff, as well as Mexican pieces by Manuel M. Ponce and Mario Ruiz-Armengol, and the Brazilian composer Ernesto Nazareth. 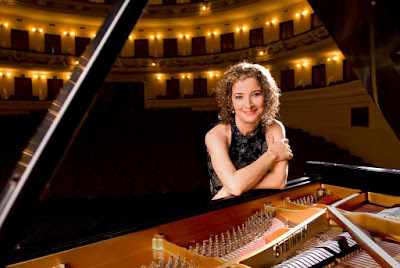 The renowned pianist Marieli Sosa was born in Mérida, Mexico. She graduated from the University of Veracruz, Mexico, and with honors from the University of Music in Vienna, Austria. She has successfully performed in different cities of Mexico, as well as in the United States, Austria and Belize. Marieli Sosa has performed as a solo in different symphony orchestras and within several Chamber music groups and ensembles. In 1997 she founded the “Jose Jacinto Cuevas” Music Centre. In 2001 she participated in the formation of the Symphony Orchestra of Yucatan. She lectures at the Yucatan School for Advanced Studies in Arts since 2005, and in January 2009 she recorded her first CD in Austria, performing Latin America pieces. Luis Arturo Romero was born in Campeche, Mexico. He has studied at the Campeche House of Culture, the Ensenada Centre for Music, as well as with the maestros Martyn van den Hoek, Ricardo Miranda and Marieli Sosa. In Boston, US, he studied with prestigious professors such as Bradford Alderman and Alexandre Rezende. His passion for Music has led him to pursue his studies further at the Yucatan School for Advanced Studies in Arts. In Mexico, Luis Arturo Romero has taught piano in Yucatan and performed as pianist at the Merida Chorus. The concerts are being organized by the National Institute for Culture and History of Belize (NICH), the George Price Centre for Peace and Development and the Mexican Embassy.